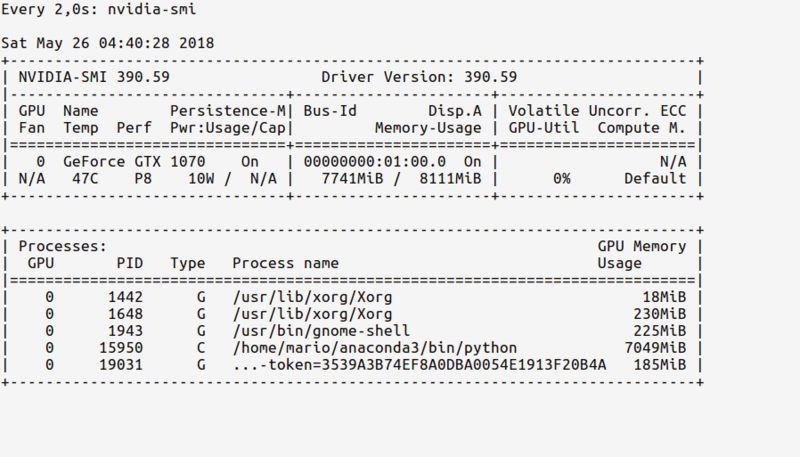 How to tell if tensorflow is using gpu acceleration from inside python shell? I have installed tensorflow in my ubuntu 16.04 using the second answer here with ubuntu's builtin apt cuda installation. Is this output enough to check if tensorflow is using gpu ? No, I don't think "open CUDA library" is enough to tell, because different nodes of the graph may be on different devices. Check your console for this type of output. Apart from using sess = tf.Session(config=tf.ConfigProto(log_device_placement=True)) which is outlined in other answers as well as in the official TensorFlow documentation, you can try to assign a computation to the gpu and see whether you have an error. Following piece of code should give you all devices available to tensorflow. I think there is an easier way to achieve this. This seems easier to me rather than those verbose logs. This will confirm that tensorflow using GPU while training also ? In addition to other answers, the following should help you to make sure that your version of tensorflow includes GPU support. I prefer to use nvidia-smi to monitor GPU usage. if it goes up significantly when you start you program, it's a strong sign that your tensorflow is using GPU. Observe how the GPU memory usage is very less (~ 200MB). Observe how our Python process from the ipython shell is using 7.7GB of the GPU memory. P.S. You can continue watching these stats as the code is running, to see how intense the GPU usage is. You can see here I'm using TensorFlow with an Nvidia Quodro K620. If you get an error, you need to check your installation. If the output is something like that /device:GPU:0, it means GPU works. Not the answer you're looking for? Browse other questions tagged python ubuntu tensorflow or ask your own question. Can I run Keras model on gpu? How to check if keras tensorflow backend is GPU or CPU version? How ensure that Keras is using GPU with tensorflow backend? How can I check whether I use CPU or GPU in TensorFlow?